Economists and others like to talk about “problems in the aggregate,” or a big-picture view of the issues. 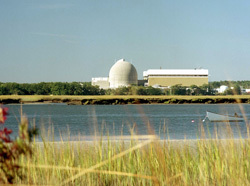 But that phrase is taking on new meaning in the case of the Seabrook nuclear power plant, where there are concerns involving the aggregate used in the concrete. More specifically, the problem at the New Hampshire facility is the intrusion of moisture into the foundation walls of certain structures, resulting in the degradation of some of the concrete. The exact term for what is occurring at Seabrook is alkali silica reaction, or ASR, which involves the hydroxide ions in the pore solution in cement paste and the reactive silica in aggregate. (Aggregates are inert granular materials, such as sand, gravel or crushed stone that, along with water and cement paste, are an essential ingredient in concrete.) The main byproduct of ASR is a gel, which can expand and may cause micro-cracks in the concrete. 4. Because progression of the concrete degradation is occurring slowly. That determination, contained in an NRC inspection report issued on March 26, was the result of reviews carried out by six of our inspectors over many months, dating back to last September. Among other things, we made use of concrete/structural integrity expertise at our headquarters office. We also had an inspector in our Region III office, in suburban Chicago, observe lab tests performed in Northfield, Ill., on concrete core samples taken from Seabrook. An important next step for the NRC’s review of the Seabrook concrete degradation will be a public meeting scheduled for Monday, April 23, at our headquarters office in Rockville, Md. During that meeting, the NRC staff will discuss with NextEra, the plant’s owner and operator, its analysis of the issue, planned corrective actions and dates to fully correct the problem, as well as other details. Based on the outcome of that session, the NRC will determine its next steps regarding the issue. One thing we have already made clear is that no decision will be made by the agency on a license renewal application for the plant until the extent of the concrete degradation is fully understood. Members of the public who would like to listen in on the meeting but cannot travel to NRC headquarters will be able to do so by phone bridge. What’s more, the slides to be used during the session will be available via an online webinar. More details regarding the April 23rd meeting are available at: http://www.nrc.gov/public-involve/public-meetings/index.cfm . This is a bad situation. The question is how can the concrete be returned back to it’s base state. I have seen many problems with cement degredation and am fully aware of the problems involved in trying to fix them. This is not a task that I would like to undertake! Well written article, but NRC should not put “cute” titles on your articles, like “Problems in the Aggregate.” If i were an employee at Seabrook, I would not appreciate the “flip” treatment of an important issue like this, one that is likely costing significant resources to resolve. You are not the media. You are the REGULATOR. You should act respectfully if you want to be respected. Next Next post: What’s So Hard(ened) About Vents?